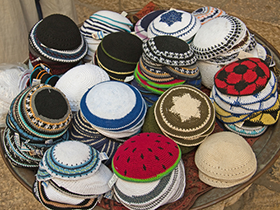 Don’t Ban the Kippah, but Let’s Think Twice before Wearing It! It was an outrage but not much of a surprise when French extreme right Front National leader Marine Le Pen announced this week that France should pass a law to ban the wearing of the kippah (Jewish skullcap.) In her defense, her position on the wearing of religious symbols doesn’t only include the kippah. She is also in favor of banning the hijab and veils. France did pass a law in 2011 to ban the burqua and hijab in public. It is also unlawful to wear a kippah or burqua on public school property. Additionally, the recent attempt by some French mayors at banning the wearing “burkinis” on French beaches was also very controversial. Miss Le Pen says that she speaks in the name of equality. She claims that to be fair, if the Muslim covering is banned, the Jewish covering must be banned as well. She also says that she has no issue with kippot but that we must be “fair” by banning both. One can appreciate Miss Le Pen’s apparent desire to be balanced, but I don’t think that her comparison between Muslim and Jewish religious symbol is a fair assessment of the problem at hand. Marine Le Pen still carries with her some of her father’s racist and antisemitic baggage. It has been rebranded in a postmodern, social justice infused package, but it is still racism. Additionally, there are valid reasons to ban some of the most extreme Muslim garb. Needless to say that the reaction from the French government was quite negative, across the whole political spectrum. The Jewish community also reacted very strongly. Rabbi Pinchas Goldschmidt (head of the Conference of European Rabbis) said that Le Pen’s proposal, “takes us straight back to the times of state-sponsored anti-Semitism under the Vichy regime.” I couldn’t agree more! Yet, Le Pen is experiencing a bittersweet relationship with some of the French Jewish community. Some Jewish people are actually considering voting for her in the next presidential elections. The wave of migrants into France and much of Europe as well as France’s Muslim community–the largest in Europe with between 6 and 7 million–are making French Jews feeling increasingly insecure. Charlie Hebdo, the Kosher Market and the Bataclan Club are just a few examples of the frailty of France when it comes to protect her citizens, let alone her Jewish community. But Le Pen is a political time bomb that could detonate onto the Jewish community in ways that nobody would have expected prior to the elections. French Jews have no business even considering Le Pen in the next presidential elections. Her desire to pas a law to ban the kippah is in line with her party’s xenophobic tendencies and should be denounced. This being said, and the kippah remaining a choice for each and every Jew to wear in public, we should exercise caution. The French government has recently advised religious Jews not to wear a kippah in public or to cover it with another hat, and that is very wise. It is sad to have to hide religious symbols, but there are areas of Paris and other large French cities like Marseille where wearing a kippah is simply dangerous. In the current France of 2016, the reality is that the Jewish community is shrinking. Aliyah to Israel was the highest in 30 years in 2014 and 2015. French Jews are scared to go out in some areas, or even to walk to synagogue or Jewish schools. Their fears are very justified. France lost about 50,000 Jews to Israel in the last 16 years. That is about 10% of the total 500,000 Jews of France (still the third largest Jewish community after Israel and the USA.) At this rate, France will lose its Jewish community and its third place in world Jewry within less than 20 years. The banning of the Muslim head garb never was as result of Islamophobia. While there might be some people who hate Muslims and/or Arabs (and I am not one of them), the honest reason behind the banning of Muslim religious symbols was and continues to be security. Proper identification cannot be performed if one’s head is entirely covered. If the Muslim community feels unjustifiably targeted, maybe they should bring their grievances to the imams and radical Islamic leaders who support and promote radical apocalyptic Islam. Islam’s reputation has definitely been stained by Islamic terrorism and the Islamic State. But please do not put the veils and the kippot on equal footing! If Miss Le Pen was truly a proponent of the French “Liberty, Equality, Fraternity” motto, she would leave the kippah alone and allow Jews to use common sense in wearing it in public. I am afraid that the France she seeks is a France without Arabs, without blacks and without Jews. This would indeed look like “Vichy Regime 2.0” Even if the current government strongly rebuked Miss Le Pen, it remains to be seen if the rest of more liberal and humanistic France will brush her off as a xenophobic fringe politician or if they will carry her further in a position of power. French Jews have enough on their plate as it stands!